Carly is now a teenager and wanted to transform her “kiddie -style” bedroom into a more age appropriate space. She loves the beach and wanted a space where her friends could relax and hang out with her. Check out the before shots below….and scroll down for the afters! A sawhorse table (Ikea) is tucked under the window with a contemporary ghost chair in front. Here are a few of my 3D drawings from a recent Kitchen/Family Rm./Dining Rm. renovation project I worked on. Sometimes clients have a hard time picturing the proposed design especially when walls are moving and spaces are being completely re-configured. These 3D renderings are a great tool so clients can get a real visual on what the finished product will look like. This particular project had 3 compartmentalized rooms: a small kitchen, an unused dining room and a family room area. My new design removed walls and completely re-configured these rooms to create a large multi-functional space for a busy family of five. 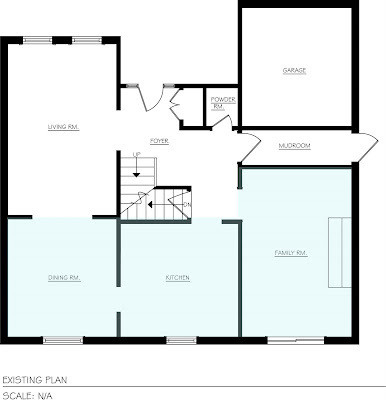 The areas highlighted in blue above were the rooms that were re-configured in the new design. Here is a bird’s eye view of the new spacious kitchen that opens to the family room through a raised bar. I relocated the patio doors to the backyard from the family room to the kitchen. This way, it is easier to access and I could then accomodate a large sectional in the family room. Again, another bird’s eye view with a better perspective of the bar area. The island had to be narrow in shape due to the width of the room; however, it does not lack in storage with effective deep drawers and a concealed microwave below. A casual kitchenette table floats off this island and features a bamboo veneer top. The pocket doors to the new dining room feature frosted glass inserts and can be closed off to hide the mess in the kitchen. The counter depth/french door fridge is flanked by a large pantry with roll out drawers in the interior…. a must have for a healthy and hungry family of 5! Two open storage areas include a wine cabinet to the right of the sink and a bookshelf by the patio doors. Three mid-sized pendant light fixtures hang over the long island & eating table. Transitioning into the family room, there is a raised bar for casual eating that looks out to the fireplace and wall mount TV. Perfect for entertaining! This millwork matches the island cabinetry and conceals a load bearing structure that is critical to the 2nd floor. Bird’s Eye view of the family room. Here is a view from the family room into the kitchen. The stainless Range hood & range is on centre with the island to create a great focal point for the entire space. For assistance with an upcoming renovation or kitchen remodel, contact me, I’d love to help!